Many of us will remember the Bush years as the administration under which Star Trek: Enterprise went off the air, an brief dark age when it appeared there would be no Star Trek on the air again for a very long time. Now we have Barack “Hope” Obama as President, and, with his administration, a brand new Star Trek movie, 43 years after the show first aired. The original Star Trek was a grass-roots phenomena, only able to stay on the air for a second and third season because of an unprecedented letter-writing campaign by its fans. The show thrived in syndication, leading to six television series totaling 716 episodes across 30 seasons, 70 million books in print, 40 video games, and this week’s release will mark its 11th feature film. Highly progressive philosophically, Star Trek portrayed a future of world peace for Earth, a united human race venturing amongst the stars. 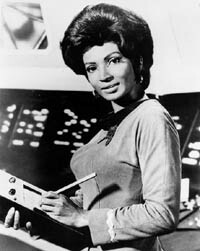 The cast was ethnically diverse, with one of the first major African American characters on an American television series in Chief Communications Officer Uhura, whose name comes from the Swahili word for “freedom,” and who came from the “United States of Africa.1” Nichelle Nichols, who played Uhura, was persuaded by Martin Luther King Jr. to stay on the show as a role model for the black community when she considered quiting after the first season. In addition to Uhura, Star Trek included the first positive portrayal of a Japanese character in helmsman Sulu. In the midst of the Cold War, the show featured the Russian ensign Chekov on the bridge. The Scottish Engineer Scotty and country doctor Leonard McCoy rounded out the cast’s cultural diversity. The show tackled social issues, like slavery and religious freedom in Bread and Circuses, where the crew encounter a planet similar to ancient Rome, complete with oppressed Christians. The episode Let That Be Your Last Battlefield, where the Enterprise picks up the last two survivors of a war torn planet, each half black and half white, but their colors on opposite sides of their faces, deals with the insane senselessness of racial discrimination. 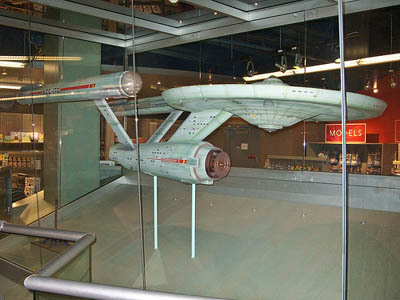 In numerous episodes, America’s cold war with Russia and the war in Vietnam were alluded to in the Enterprise’s encounters with Klingons and Romulans. With a firm historical, moral, and intellectual grounding in its storytelling, Star Trek was able to become one of the most culturally influential television shows in history. 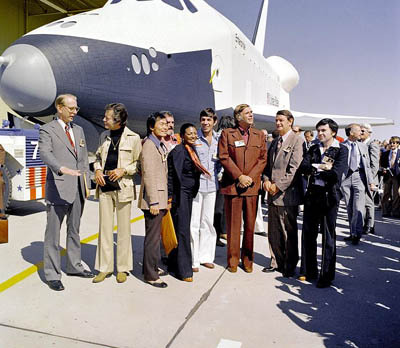 The fans were able to convince NASA to name the first space shuttle orbiter after the USS Enterprise. Star Trek offers the possibility of a similar future to the human race. The show has stood out and remained strong these four decades because of its positive message and vision. With their incredibly advanced technologies and their strong moral character, the crew of the Enterprise are role models for a human race. The documentary Trekkies reveals a fan base comprised of geeks and nerds, but they are also scientists, inventors, and doctors. The USS Enterprise’s name follows a long history of over 26 real-life ships from the HMS Enterprise (1709-1749) to the 1961 Aircraft Carrier USS Enterprise (CVN-65) to the 1976 Space Shuttle Enterprise and soon the VSS Enterprise Virgin Galactic’s first commercial spacecraft. The course of human history is one of incredible social and technological improvement, we are reaching further into the stars, where we have Star Trek’s visionary outlook to guide us. 1 The original pilot for Star Trek included a woman in the role of second-in-command, but network executives at NBC demanded she be cut from the show. Despite the show’s progressive vision, the mini-skirts and secretarial positions women filled in the show have always been an unfortunate part of its history, and not part of Gene Roddenberry’s original vision. Later spin-off shows would put women and other ethnicities in leadership positions. You can watch every episode of the orginal Star Trek series online here. Also, a lot of our modern-day “inventions” were inspired by Star Trek. Like the cell phone. I believe the guy who actually came up with it was a Star Trek fan inspired by Star Trek. There’s a whole hour special on all the various inventions — they find the creators, and the creators basically all tribute Star Trek:TOS as their inspiration. Wow, as only a passing viewer of a couple Star Trek episodes, I never realized there was that much political/philosophical thought put into the show. But then, I didn’t watch it much at all, so not surprising I missed it. I’ll need to watch some of the old episodes again. Going to see the new movie pretty soon and can see how they compare. I always enjoy a screenwriter who can give me something to think about. This explains the hype, too. At first I was surprised there was such a strong push for the mainstream movie coming out Friday, but now it’s starting to make sense. And all the talk seems to be positive. You can see a video about some of what people are saying at http://www.newsy.com/videos/beam_me_up_box_office/. They tend to be pretty balanced as far as reporting the good and the bad, but that video seemed to be all good.